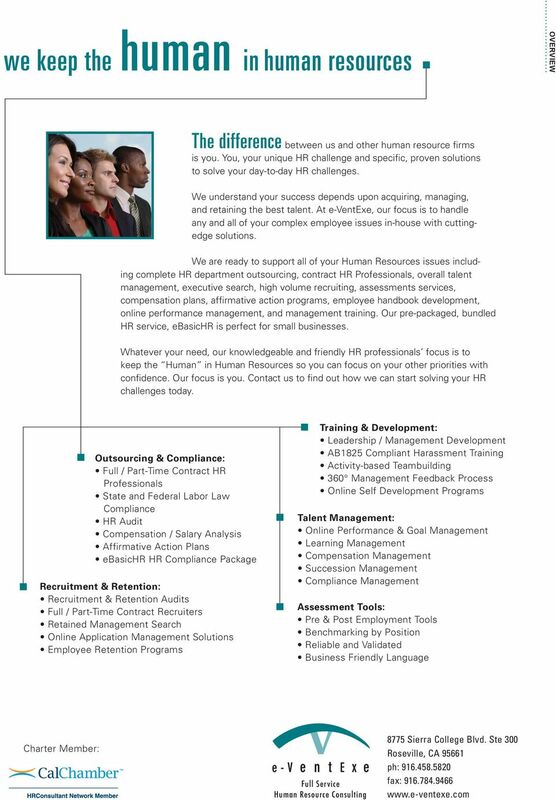 Download "we keep the human in human resources"
5 managing and growing your workforce talent TALENT MANAGEMENT Today s workforce landscape demands that you do more than simply conduct annual employee reviews. On-going assessment, performance management, and career-pathing keep your team engaged, satisfied and producing at the highest level. 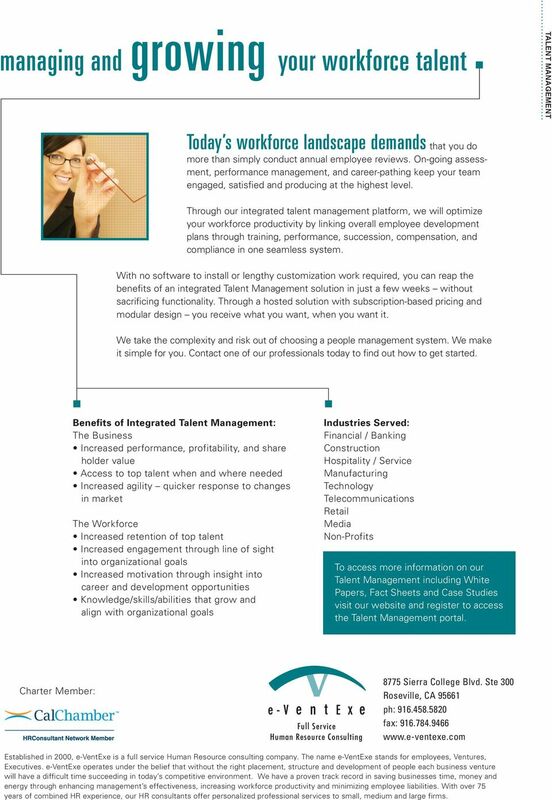 Through our integrated talent management platform, we will optimize your workforce productivity by linking overall employee development plans through training, performance, succession, compensation, and compliance in one seamless system. With no software to install or lengthy customization work required, you can reap the benefits of an integrated Talent Management solution in just a few weeks without sacrificing functionality. Through a hosted solution with subscription-based pricing and modular design you receive what you want, when you want it. We take the complexity and risk out of choosing a people management system. We make it simple for you. Contact one of our professionals today to find out how to get started. Benefits of Integrated Talent Management: The Business Increased performance, profitability, and share holder value Access to top talent when and where needed Increased agility quicker response to changes in market The Workforce Increased retention of top talent Increased engagement through line of sight into organizational goals Increased motivation through insight into career and development opportunities Knowledge/skills/abilities that grow and align with organizational goals To access more information on our Talent Management including White Papers, Fact Sheets and Case Studies visit our website and register to access the Talent Management portal. 6 select employees with the right business fit ASSESSMENT SERVICES Making the right hire is more than sourcing. It s about fit. Relying on resumes and interviews as a means to selection is as effective as throwing darts at balloons at the fair. Those old school assessment practices lack the reliability, consistency, and legal defensibility you need in order to find the truly best talent for your organization. 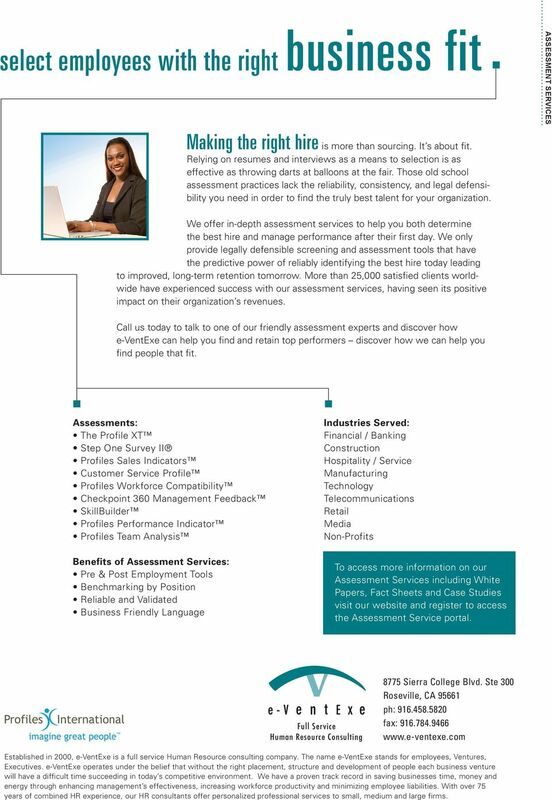 We offer in-depth assessment services to help you both determine the best hire and manage performance after their first day. We only provide legally defensible screening and assessment tools that have the predictive power of reliably identifying the best hire today leading to improved, long-term retention tomorrow. More than 25,000 satisfied clients worldwide have experienced success with our assessment services, having seen its positive impact on their organization s revenues. Call us today to talk to one of our friendly assessment experts and discover how e-ventexe can help you find and retain top performers discover how we can help you find people that fit. Assessments: The Profile XT Step One Survey II Profiles Sales Indicators Customer Service Profile Profiles Workforce Compatibility Checkpoint 360 Management Feedback SkillBuilder Profiles Performance Indicator Profiles Team Analysis Benefits of Assessment Services: Pre & Post Employment Tools Benchmarking by Position Reliable and Validated Business Friendly Language To access more information on our Assessment Services including White Papers, Fact Sheets and Case Studies visit our website and register to access the Assessment Service portal. TEAMWORK. Recruitment HR Consulting Market Research A WINNING TEAM IS GREATER THAN THE SUM OF ITS PARTS. horsham training centre training for business Professional courses at Horsham Training Centre bringing skills and business performance together Boost your business performance with training you can trust! What We Do. 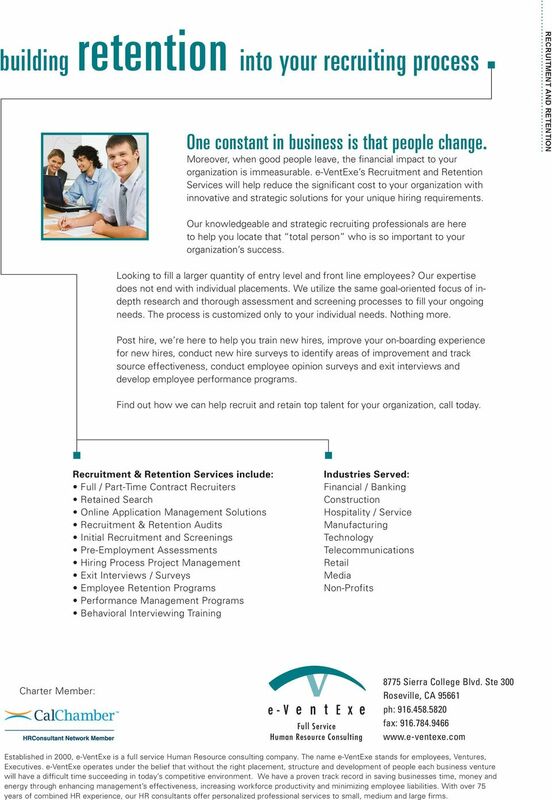 What can ASHR do for you? 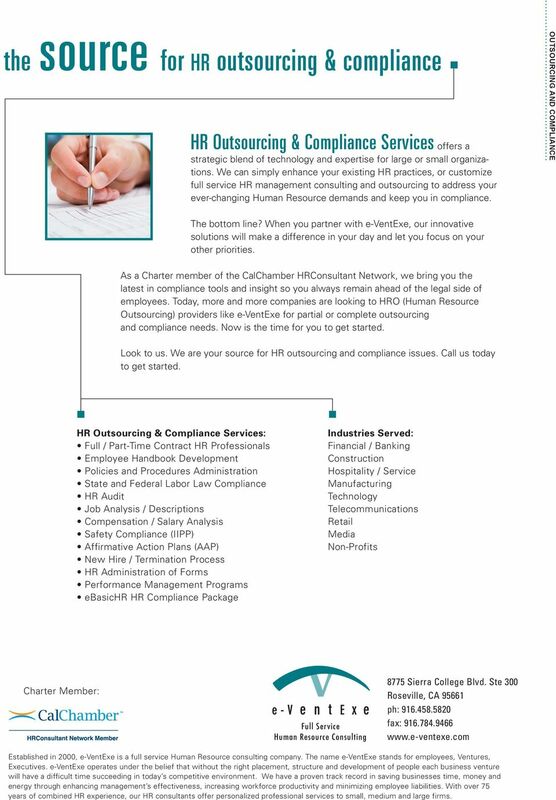 Turnkey HR Outsourcing Solutions that Deliver Solid Results. THE SMALL BUSINESS GUIDE TO OUTSOURCING. 1 866-228-9675 www.adp.ca The ADP logo is a registered trademark of ADP, Inc. Since when can a revenue cycle company help grow your healthcare organization? Fully in Control. Management Information. 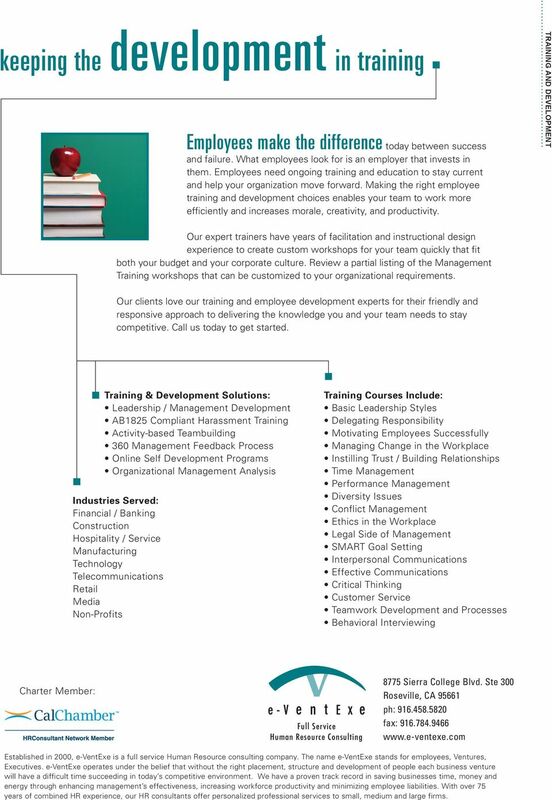 Pomerantz can customize virtually any type of report to meet your productivity requirements.